Senior author Goetz Ehrhardt, now at University of Toronto, used to be in Cooper’s lab, and their two labs worked together on the JCI Insight paper. The authors explain how lampreys were immunized with bone marrow cells from a multiple myeloma patient, and then VLR genes were isolated from the lampreys. The researchers then picked out an individual VLR that reacted specifically with plasma cells, but not other cell types. Protein analysis revealed that the VLR recognizes a molecule called CD38. The lamprey VLR recognizes a unique structural feature, or epitope, of CD38 found only on plasma cells. CD38 appears on other immune cell types as well. It turns out that CD38 is also the target of daratumumab, a more conventionally-derived (ie, no lampreys involved) antibody that is now FDA-approved for the treatment of multiple myeloma. This shows that the lamprey immunization route did not produce a fluke. 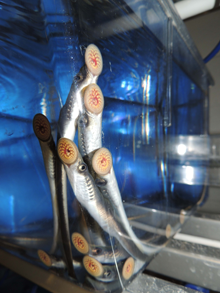 Lampreys’ immuno-molecular distinctiveness is the rationale for a start-up company called Novab. Cooper says that his lab and Ehrhardt’s continue to work together on similar lamprey VLRs, with possible future use by Novab. This article on work by another one of Cooper’s alumni, the late Zeev Pancer, uses the term “lambodies” (lamprey antibodies). In Emory’s Department of Pediatrics, Trent Spencer and colleagues have been investigating lamprey VLRs as possible steering wheels for chimeric antigen receptor T cells, the much-touted cancer immunotherapy.